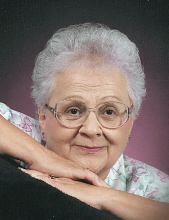 Jo Lee (Ballard) Faulkner, 85-year-old Vinita resident went to be with her Lord on Saturday, March 9, 2019 at the Heartsworth Nursing and Rehabilitation Center. An only child, she was born on February 1, 1934 in Oklahoma City to Jesse L. and Florence A. (Friend) Ballard. Jo Lee and her three children moved to Vinita the summer of 1966. Through a series of events and being introduced by their daughters, Jo Lee was encouraged to invite Vol Faulkner to Thanksgiving dinner. The families were united together when they married on March 23, 1967. Together they raised five of the seven children that were still at home. In the late 60’s they leased Grand Point Resort and the family met many wonderful people that came to fish, swim and rent cabins. They moved back to the big two-story house on Thompson street in Vinita, and Jo Lee would later manage the Vinita Country Club. When Vol retired, they moved to Bernice and fishing became their favorite pastime. Jo Lee loved to do folk art painting. Vol would cut out her wood projects and she would paint them. She also gave classes in the basement and “Granny Jo’s Folk Art” was born. During this time, they also sold items in the Country Folk Art magazine and had a booth for several years at War Eagle. They loved making projects for the kids and grandkids. They made and painted the baby cradle, that many of the grandchildren have used and passed down. When health became a concern, they moved back to Vinita, where she enjoyed quilting and scrapbooking. Jo Lee also enjoyed going to the library to work on genealogy. She attended many rodeos, horseshows, county fairs, Will Rogers Memorial Rodeo parades, basketball, softball, and football games, watching her grandchildren. Her family was her world and she was the glue that held them together. Preceding her in death were her parents, her husband of 41 years, Vol Faulkner, a daughter, Barbara (Faulkner) Kiser. The family includes: her children, Christy Kenworthy (Albert) of Welch, Mark Letbetter (Janie) of Owasso, Donn Letbetter (Yvonne) of Denver, Jeanette (Faulkner) Templeton of Little Rock, Floyd Faulkner (Sherry) of Vinita, Joe Faulkner (Marsha) of Nowata; grandchildren, Lori Kerby (Jason), Kassi Simmons (Ronnie), Kylee DeBock (Dillon), Tay Houck (Jenny), Angelea Letbetter, Jesse Letbetter, David Caudill, Cindy Snyder, Sandee Marlow, Matt Faulkner (Olivia), Mandy Kiser, Karman Tinsley (Derrick), Tripp Kiser, Nicole Letbetter, Josh Letbetter (Michelle), Alicia Martinez (Tony), Joey Faulkner, Jenny Duncan, David Faulkner. Great-grandchildren, Wacey Sewell (Rob), Layla Sampson, Tori and Mersadies Simmons, Colston and Riggin DeBock, Isaiah and Iaunna Letbetter, Ayiden and Noah Letbetter, Nolan, Barbara and Lincoln Tinsley. The family will receive friends from 5-7 PM on Wednesday, March 13, 2019 at the Burckhalter-Highsmith Funeral Home Chapel. Honorary bearers will be; Josh Letbetter, Tony Martinez, Ronnie Simmons, Dillon DeBock, Jesse Letbetter, and Albert Kenworthy. The celebration of life will be held on Thursday, March 14, 2019 at 10:00 AM at the Burckhalter-Highsmith Funeral Home Chapel, with Pastor Robert Sanders officiating. The committal will be held at the Fairview Cemetery in Vinita. Friends may give to the Miami Animal Alliance, P. O. Box 1623, Miami, OK 74355 or the Alive Church Vinita, P. O. Box 283, Vinita, OK 74301. Online condolences may be made at www.highsmithfh.com or on our funeral home Facebook page. Arrangements are by the Burckhalter-Highsmith Funeral and Cremation Service of Vinita (918)256-6444. To send flowers or a remembrance gift to the family of Jo Lee Faulkner, please visit our Tribute Store. "Email Address" would like to share the life celebration of Jo Lee Faulkner. Click on the "link" to go to share a favorite memory or leave a condolence message for the family.